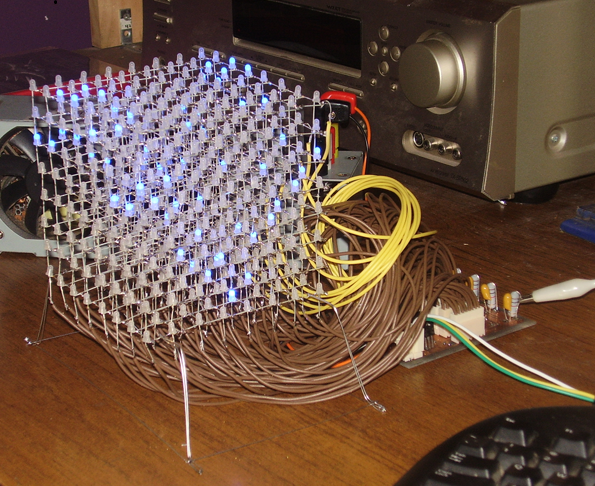 This 8x8x8 LED cube with 512 LEDs takes the old 3x3x3 light cube made up of 27 LEDs to the nth degree. This, certainly more time consuming project, actually involves a simpler design. By using a STP16CP LED sink driver, Nick (the creator), was able to reduce the component count. The LED sink driver can control 16 LEDs at once, as opposed to single LED control from the 3x3x3. Programming came by way of MATLAB, which explains many of the shapes I learned in Calc 3 and diffy-q. I suggest taking a few minutes to check out the video of this amazing project.